Sunday, June 2, departing at 8:00am (7:30am from the subway). 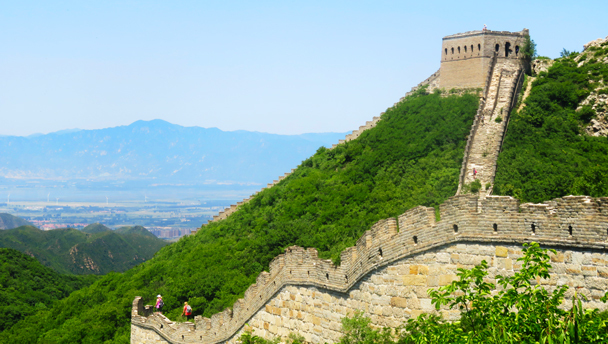 In Brief: Hike the Great Wall, starting from Stone Valley Village and following a line of wild wall up to a tall tower with 360° views of mountains, valleys, small villages, and a long line of wall heading high into the hills. The General's Tower on the Stone Valley Great Wall. On this hike we make a loop out of Stone Valley Village and hike the same line of wall as our Middle Route of the Switchback Great Wall hike. Starting at Stone Valley Village gives us a longer hike and some different angles for our views of the Great Wall, including a great look at what an attacker might have been faced with trying to cross over to the Beijing side. We begin with a quick stroll through Stone Valley Village, passing by the courtyard guesthouse where we’ll enjoy a big meal after the hike. From the guesthouse we walk out into the fields in the valley behind the village. At the back of the fields we’ll find the dirt trail that leads up and over our first hill of the day. It’s slightly steep in places, but we’ll be up on top in about 20 minutes. As we crest the hill we’ll spot the main line of Great Wall on the next ridge, right in front of us. At our feet, though, is the older line of Northern Qi-era Great Wall, by now just a rough line of rocks. Quite easy to miss! There’s more of this old wall in the area, but most of it was used as a base for the later Ming Dynasty construction. A trail takes us down into the valley below the Ming wall, and then through a pass where the wall has all fallen down. Hooking around, we start on our second hill climb, this time heading for the wall. The wall is quite high above us, and it’s easy to imagine how difficult it would be to climb up to attack. Luckily for us no one will be shooting arrows at us as we climb, and after about 15 minutes of uphill we’ll be on top of the wall—the same part we saw as we crossed the first hill. After taking a break we’ll continue up along the wall, following a rough and unrestored section all the way up to a 1034m beacon tower known as the General’s Tower, the largest on this line of wall. From up on top of the tower we’ll have great views of the surrounding mountains, with more wall seen snaking off into the distance. We get higher and higher on the wall, making a few detours around broken sections, and then the big staircase that leads to the General’s Tower will come into view. It’s known as the General’s Tower because it would have been a command post. Our guides will be able to point out other tall towers in the surrounding mountains – all with line-of-sight – which would have formed a sort of communication network. From the General’s Tower the hike continues, following the wall south. Not far along is a spot where you can get an angle on the General’s Tower that makes for a superb photo. Eventually we pass through two closely-spaced towers that protect another pass, and it’s here where we farewell the wall for the day. From the pass we follow a well-formed trail down through forest, and then back along the road to Stone Valley Village to finish the hike. Parts of the Great Wall here are rather steep and slippery. There’s a significant amount of crossover with this hike and our Middle Route of the Switchback Great Wall hike, if you’ve done that one before. Blue skies, blossoms, and big climbs on the Great Wall—see 36 photos from the Stone Valley Great Wall hike. See a set of 17 photos from a hike on the rough and unrepaired Great Wall at Stone Valley. Big winds brought a blue sky and the feeling of winter to the high up places at Stone Valley—see 20 photos of Great Wall and mountains. Autumn colours were already starting to show on this Great Wall hike at Stone Valley—take a look at 27 photos. See 17 photos from a hike along the Great Wall above Stone Valley—green hills, blooming flowers, and a beautiful section of unrepaired Great Wall. We had lovely blue skies on this walk on the Great Wall at Stone Valley, and we had the wall all to ourselves—see 25 photos. Nineteen photos from a hike along the Great Wall above Stone Valley village. 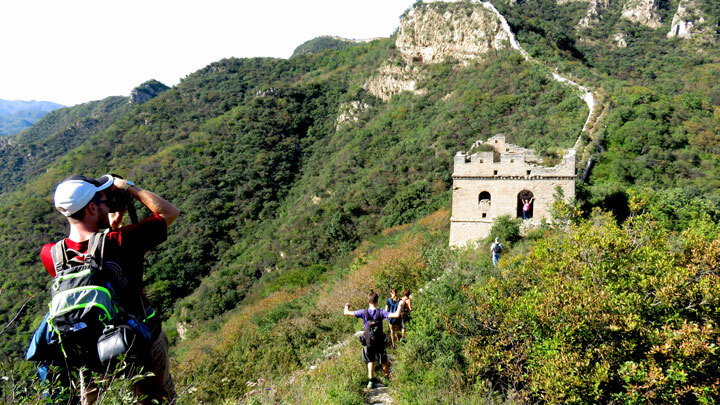 15 photos from our Chinese New Year’s Eve Great Wall hike. See eighteen photos from a hike in the snow along the Stone Valley Great Wall. Photos from a springtime walk at the Stone Valley Great Wall.